Pam said she wouldn’t have scheduled a mammogram if it hadn’t been for her primary care doctor. But then she may not have discovered she had early-stage cancer. Pam Carnahan didn’t think she needed a mammogram but her doctor’s office kept insisting she make an appointment as part of routine health maintenance. And it was a good thing she did as she’s now cancer free. Photos by Joel Blocker, for UCHealth. When her primary care physician, Dr. Brian Schmalhorst, told her it was time to get a mammogram, she blew it off. Then she got a call from his office, UCHealth Family Medicine Clinic in Greeley, reminding her again to schedule a mammogram. Women of average risk should begin routine screening mammography annually at age 40 and continue on for as long as they are in good health as recommended by the American College of Radiology and National Comprehensive Cancer Network guidelines, said Amanda Wood, UCHealth’s director of breast imaging for northern Colorado. At 68 years old, Carnahan had no major health issues except for high blood pressure, for which she takes medication. And refilling that medication, she admitted, is really the only reason she sees her doctor annually. On Nov. 30, 2017, Carnahan had a mammogram, which detected a mass. Schmalhorst’s office has since changed its process so that patients like Carnahan can schedule routine health screenings before they leave the office so they don’t have to make that extra call, according to Lyli Hernandez, Schmalhorst’s medical assistant. On Dec. 14, 2017, Carnahan went back for a diagnostic mammogram and ultrasound. And indeed a mass on her left breast was forming near the chest wall. Because of its location and small size, it would have been almost impossible to detect with a self-breast exam. “They made me an appointment for a needle biopsy the next day, and I thought to myself, ‘Why am I coming back so soon?’ That concerned me,” Carnahan said. Approaching her 70s, Carnahan had never considered her risk of cancer. She didn’t have a family history of breast cancer. However, her mom had died of lung cancer as a non-smoker; her mom’s sister was diagnosed with ovarian cancer, as was her dad’s sister, and another relative had melanoma. But she mistakenly thought she was past the age of worry. One in eight women will develop breast cancer at some point in their lives, and the risk of developing it increases with each decade, according to the National Cancer Institute. The Monday following her needle biopsy, Schmalhorst called her. It was Stage I breast cancer. 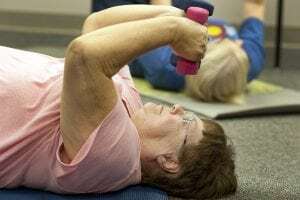 Pam Carnahan, 68, participates in her weekly “Strong People” class in Greeley in September 2018. And otherwise healthy women, Carnahan didn’t think she needed a mammogram. But when she did get one, it detected stage one breast cancer. She’s now back to her class after completing radiation in April 2018. Schmalhorst recommended UCHealth surgeon Dr. Stevens Dubs. Carnahan brought her husband to meet with Dubs. Carnahan met with Dr. Farrah Datko, UCHealth medical oncologist specializing in breast cancer. On Jan. 19, 2018, Carnahan arrived at UCHealth Medical Center of the Rockies in Loveland for the surgery that would remove the lump. Because of its early stage, Carnahan was able to choose a lumpectomy over a mastectomy. A lumpectomy involves the removal of the cancer and some of the surrounding normal tissue, whereas a mastectomy removes the entire breast. Dubs also performed a sentinel lymph node biopsy, removing only the lymph nodes under the arm where cancer would likely spread first. Following the lumpectomy, Carnahan required radiation, and she qualified for accelerated radiation treatment, reducing the number of treatment visits to only four weeks. And because another test showed she would not benefit from chemotherapy, she was able to forego that treatment. Carnahan had 20 rounds of radiation treatments and finished April 4, 2018. With the cancer being on the left side near her heart, Carnahan required a highly precise image-guided radiation treatment to limit exposure to the heart. This required her to be calm and keep a low breathing and heart rate during the treatment. Pam Carnahan, 68, participates in her weekly “Strong People” class in Greeley in September 2018 after completing radiation in April 2018. Carnahan will take a pill for the next five to 10 years that lowers the estrogen in her body. Certain breast cancers feed off of estrogen, Datko explained. Studies show that reducing estrogen in the body reduces the risk of cancer recurring. Studies continue to find new methods to fight breast cancer. However, Datko said she continues to get younger and younger patients, again stressing the importance of regular mammograms and considering other cancer-prevention tools, such as genetic testing for high-risk patients. There are different guidelines about how frequently a woman should have a screening mammogram, and that’s why it’s important to talk about the risks and benefits of the different guidelines with your primary care physician, Wood explained. Screenings aren’t recommended for average-risk women until at least 40 because breasts are denser in young women, Datko said. That density makes it harder to see cancer, and therefore, not that useful. By 40, a woman’s breast starts to lose that density. Every patient at the UCHealth Cancer Center – Harmony Campus is screened for whether they should be counseled on genetic testing. For patients with certain cancers and a family history of cancer, genetic testing can help physicians tailor treatments and recommend medications, as well as determine if risk-reduction methods, such as removing one’s ovaries to reduce the risk of cancer, is a good option, said Leslie Ross, genetic counselor at the cancer center. Ross also has helped establish a high-risk breast cancer program, to which anyone can be referred if they have a family history of cancer and want to know what to do. In that program, the patient is evaluated, and if a high risk for cancer is found, they stay in that program throughout their lives, receiving such things as early or more frequent screenings and counseling on risk-reduction methods available to them. Once breast cancer spreads beyond the breast and into other areas of the body, called stage 4, it is incurable, Datko explained. If Carnahan had ignored her doctor’s call, she may have very well found herself in that place.